Upon being re-elected, President Muhammadu Buhari endeared himself once again to the citizenry when he promised to show significant improvement in his second term. Buhari had also attributed a great deal of his first term setbacks to a dysfunction in the legislature where the opposition seem to dictate the content and pace of his change agenda. However, any sober analysis of the executive-legislative crisis will show that a perceived injustice towards a section of the country during Buhari’s first term had a huge impact. The injustice had incurred the wrath of a diverse mass of Nigerian socio-political elites, which emboldened the leadership of the legislature to prevail. Unfortunately, however, the ruling All Progressives Congress (APC) does not appear to have learnt its lessons. Recall that the APC national chairman, Adams Oshiomhole, recently declared that the party has adopted Ahmad Lawan from the North-East as the next Senate president. So, is APC really thinking? Either way, the glaring implication of the latest zoning order is that, with the seeming replacement of Justice Walter Onnoghen as the chief justice of Nigeria, the North is set to produce the heads of the three arms of government: the executive, legislature, and the judiciary. Combine it with the reality that the region currently controls virtually all critical government agencies, including the Police, Army, Airforce, State Security Service, Nigeria Security and Civil Defence Corps, Federal Fire Service, Immigration, Custom and Exercise, National Population Commission, Independent National Electoral Commission (INEC), Economic and Financial Crimes Commission (EFCC), Nigeria National Petroleum Corporation (NNPC), and much more. Second, while President Buhari may not have bad intentions, it is important to point out that besides his first tenure (2015-2019), recent Nigerian history has not recorded any instance where a zone or region was blatantly targeted because the people freely exercised their democratic franchise. It has become imperative, therefore, to zone the Senate presidency to the South. The proponents of the North retaining the Senate presidency have inclined their logic to a prevailing assumption that has its origin in Buhari’s gaffe of 2015 that government patronage under his regime would mirror voting preferences. But those peddling such notion are in stark conflict with democratic virtues, as well as Nigerian history. First and foremost, free choice, opposing voices, and the right to dissent are treasured virtues of democracy. In short, any government or system without a dynamic opposition activity has earned another name, which is totalitarianism. Therefore, instead of ceaseless threats of vendetta, the government should learn to show tolerance towards those who oppose it. But if the party must witchhunt for electoral shortfalls, it ought to start within itself — and from the main culprit at the top. 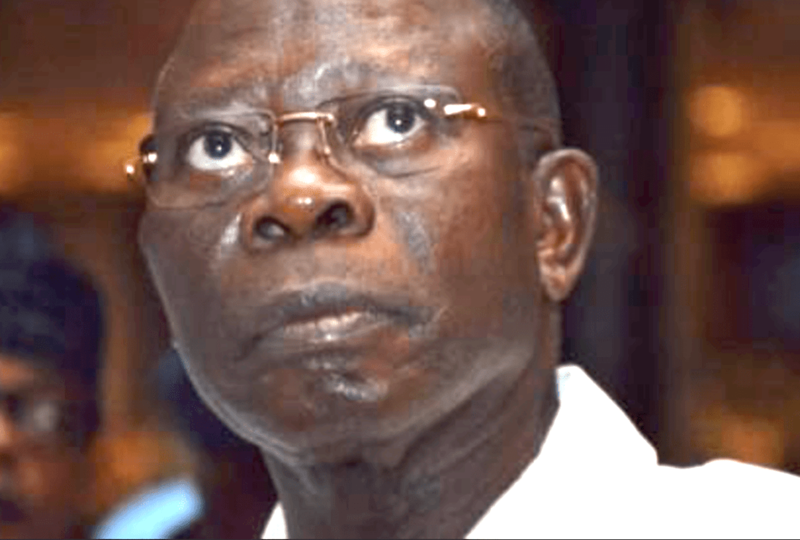 The APC chairman, Adams Oshiomhole, is on record to have brazenly imposed unpopular candidates, particularly in the South; heightened crisis within the party; and orchestrated arguably the worst party primaries in national experience, thereby not only losing the national election in his home State of Edo, but also losing seven governorship seats that the party had won in 2015 to the opposition, namely in: Oyo, Imo, Adamawa, Bauchi, Benue, Zamfara, and Sokoto States. Needless to hint that Osun State hangs in a balance. Second, while President Buhari may not have bad intentions, it is important to point out that besides his first tenure (2015-2019), recent Nigerian history has not recorded any instance where a zone or region was blatantly targeted because the people freely exercised their democratic franchise. A fitting analogy are the dynamics after the presidential election of 2003. Though the North-West zone voted massively and steadily for the then-candidate Buhari over Peoples Democratic Party (PDP) candidates, such free choice did count against the region in producing the speaker of the House after the 2003 polls nor factor in the party’s nomination of Umaru Yar’Adua in the elections of 2007. The North-West opposition posture definitely did not preclude the zone from producing the PDP vice-presidential candidate under Jonathan in 2011. It also did not deny the zone its fair share of powerful portfolios after the 2011 elections, for example, the speaker of the Federal House, minister of Defence, Mines and Steel Development, Education; and national security adviser, among many others. Furthermore, at no time throughout the years power resided in the South under Presidents Olusegun Obasanjo and Goodluck Jonathan did any region – North or South – controll all the three arms of government. It is also worthy of note that President Yar’Adua did not show any discriminatory tendency towards any zone. Of course, zoning is not the sole panacea to national problems, but there is the need for equity and fairness. Lest we forget, the plausible reason President Buhari was adopted as a sole candidate of the APC in this electoral season was predicated on an unwritten zoning arrangement between the North and South. The crux of the matter is that Nigeria’s richness lies in her diversity, voting not excluded. This diversity is reflected in Nigeria’s federal system… Therefore, any attempt by a central government to perpetrate injustice towards any state, zone or region merely because of voting preferences is to fan the embers of crisis. Let justice prevail. The new generation of Nigerians yearn for a progressive country — diverse, equitable, just, and free. Many in the APC ranks understand this. But their stoic silence on the absurd zoning order is understandable. This is a transition period with a lame duck president. Political opportunism and sycophancy have taken over public interest. If President Buhari does not get the gist, he is doing so at his own peril. Buhari must also not forget the following parting words to him from the Late Maitama Sule: “Justice will bring about peace. Peace and stability are the pre-requisites of development…Behind every crisis anywhere in the world is injustice and the solution to that crisis is justice… do justice, irrespective of their tribe, religion or even political inclination.” It goes without saying that the brewing injustice in APC — based on political inclination — is bound to provoke another set of executive-legislative crisis. With the opposition likely to produce about 42 senators out of the 108 members, it will not be out of place if 13 patriotic APC senators decide to align with the opposition to upset the apple cart towards the greater good. The crux of the matter is that Nigeria’s richness lies in her diversity, voting not excluded. This diversity is reflected in Nigeria’s federal system. It is also evident in national revenue, which is accrued from the federating states endowed with remunerative resources. Therefore, any attempt by a central government to perpetrate injustice towards any state, zone or region merely because of voting preferences is to fan the embers of crisis.